This seemed like a foster home. The Bouldrys were listed with a biological daughter and four “boarder” children. Three of the children are under the age of 3. The family group just above the Bouldrys on the same census page also had three very young boarders. Geraldine’s birthplace is written as Massachusetts, as are the birthplaces of both of her parents. This census record agrees with the information on Geraldine’s birth certificate. Why was Geraldine not living with her parents? In 1930 Geraldine’s father, Lawrence Healy, was living with 22 male lodgers in a shoe factory on Ward Street in Brockton. His profession was again an automobile painter. I did not find Geraldine’s mother, Ethel Van Blarcom Healy, in the 1930 census. But in the 1920 Census  she was living with her first husband William Goodrich, daughter Evelyn Goodrich (age 10), and son William Goodrich (age 1). She apparently was widowed in 1924. In 1927 she married Lawrence Healy. In the 1940 Census  Ethel Healy is living with her 21-year-old son William Goodrich in Brockton. In several city directories  between 1936 – 1961, Ethel was living in Brockton, sometimes with her son William, but never with Geraldine. Geraldine appears in the 1947 Brockton, Massachusetts city directory  at 90 Gladstone Street, the same address as listed in her 1946 Brockton High School Yearbook, the Brocktonian. Her father’s WWII draft registration card  gives his address as 90 Gladstone Street and his contact person as Miss Geraldine Healy; she would have been 14 years old. I have found no other record of Geraldine living with either of her birth parents during her childhood in Brockton. From her marriage license application, she was living in Fort Lauderdale, Florida at the age of 19, having apparently left Brockton soon after the city directory entry was recorded. 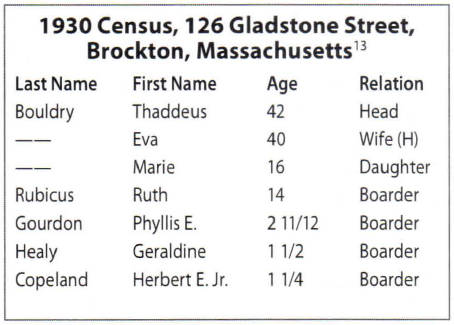 The address of 90 Gladstone Street in Brockton does not appear in the 1940 Census. Gladstone Street is only a few blocks long, bordered by Centre Street and Crescent Street,  and was in the 12-53 enumeration district of the 1940 census . I reviewed all 39 pages of that district, making a list of all Gladstone addresses. There were 21 entries, from 11 Gladstone to 126 Gladstone. Number 90 was not enumerated in the 1940 census. I backtracked to the 1930 U.S. Census to look for 90 Gladstone Street and found a Mason family. Ernest and Margaret Mason were living with their three children and two boarder children under the age of 4: another foster home. Geraldine’s documented address from 1942 – 1947 was a foster home in the 1930 census. Because of the recurring theme of child boarders, I wanted to know more about the foster care system in Brockton in the Depression era. I returned to the Association of Professional Genealogists to find someone in Massachusetts that might know about this period. Among the several genealogists listed, I found the name, Tricia Healy Mitchell, and it becomes obvious whom to choose. Although Tricia turned out not to be a relative, she was an immense help and pointed me to an article in The Irish Ancestral Research Association (TIARA) Fall 2017 newsletter titled, “Children’s Social Welfare Records at the University of Massachusetts Boston” by Jessica Holden. The article documented several aid societies and orphanages in the Boston area and where surviving records are housed. Tricia agreed to spend several hours combing through the records at the Joseph P. Healey Library at Boston University, but unfortunately, no trace of Geraldine was found. By continuing research on the family, I was able to locate two additional living family members for Rodger H. Clapp; his 91-year-old sister living in Boca Raton, Florida and his youngest son living in Texas, a half-brother to Rodger Jr. 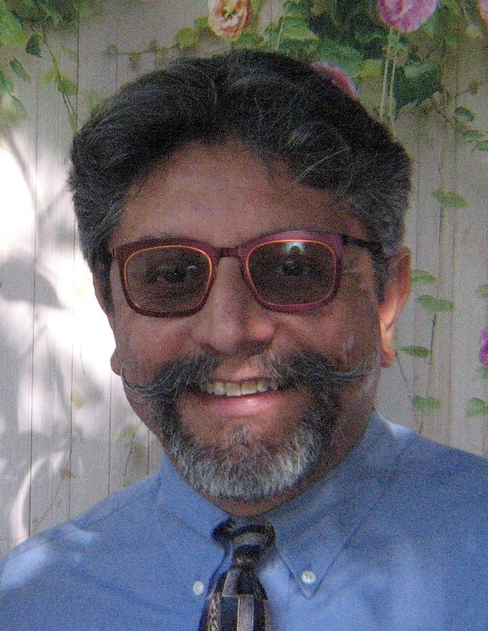 I contacted the son, through LinkedIn and was very happy when he agreed to speak with me. He had no information on his father’s first wife, Geraldine. The family had no contact with her since she abandoned her young son and husband in 1950. This was new information! Rodger Jr.’s half-brother had lost contact and did not know much about his brother’s life. I filled him in on what I knew. Rodger Jr. married his first wife in 1970 while in the Navy in Hawaii. They moved to San Diego, California. In 1979 he abandoned his wife and twos sons, aged 7 and 2. His sons never heard from him again. Rodger married again in 1979 and had a third son. In total Rodger had three biological sons and one stepson from his third marriage. Rodger Sr.’s elderly sister in Boca Raton was very welcoming and spoke with me at length. She had first-hand memories of her brother’s first wife as a nice person. But without forewarning, Geraldine dropped off her infant son at her mother-in-law’s house one morning in 1950 and never returned. Rodger Sr. had reported no problems in the marriage. Rodger Jr. was less than a year old when his mother walked out on the family. Why she left will remain a mystery because all the players are deceased. But this explained why Rodger Sr. was the one to file for divorce and why he received custody of his son in 1952. 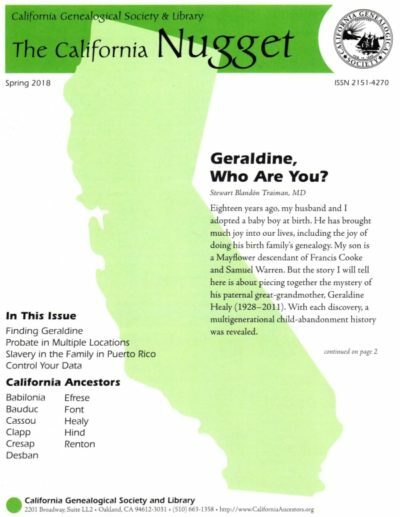 What happened to Geraldine after 1950? Regular online searches yielded no clues on this mystery. Did she stay in Florida? Was she still alive in her 90’s? If she returned to Massachusetts, then to what family? Did she remarry? Did she have other children who would be related to my son? The first two Geraldines had their Social Security cards issued in Illinois. The third one was easy to track to a maiden name that was not Healy. The fourth one’s card was issued in New York State. This left the fifth candidate as the best possibility, with a card issued in Massachusetts before 1951. Was Geraldine M. Harding the same person as Geraldine May Healy? I searched recent newspapers for an obituary without success. I searched PeopleFinders.com and BeenVerified.com for Geraldine Harding and discovered that she was the wife of James E. Harding. 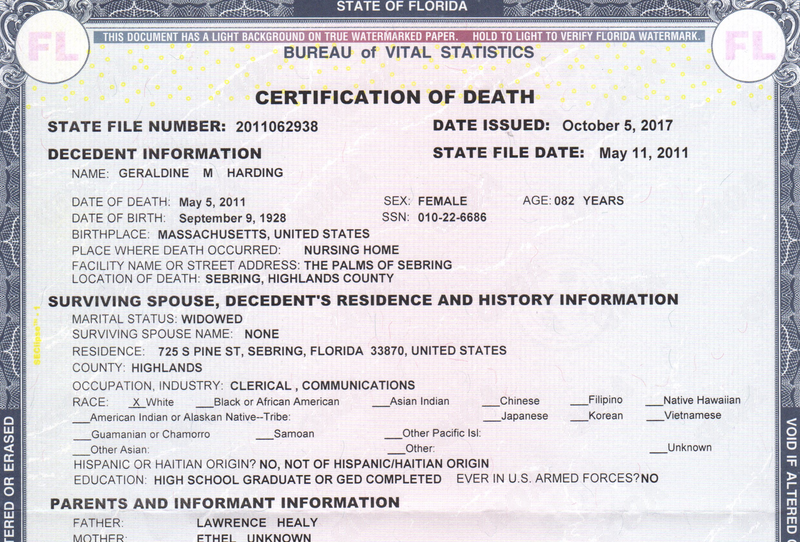 I ordered the death certificate for Geraldine M. Harding  from the Florida Department of Health and Vital Statistics. The document further confirmed Harding as the correct Geraldine because her parents were given as Lawrence Healy and Ethel Unknown. [See Image 6] The certificate gave one more very important piece of information: The informant of the death was stepson. His address in Boca Raton was also on the death certificate. A stepson? I found the stepson on the Florida voters website  and confirmed his address. The site also gave a phone number. I left a message and to my surprise and delight, he called me back. He didn’t know much about his stepfather’s second wife, but he said she didn’t have any other children, had retired from AT&T and loved to clog dance. He knew that she had a son from a previous marriage, but she never talked about that child. Geraldine May Healy was born on 9 September 1928 in Brockton, Massachusetts to Lawrence Healy and Ethel Van Blarcom. Her early life seems to have been spent in foster care. Upon reaching the age of majority, Geraldine left Massachusetts for Florida and at the age of 19 married Rodger Houghton Clapp in 1948 in Georgia. Two years later they had a son, Rodger Corderey Clapp. Before her son was a year old, Geraldine left her husband and child without warning or explanation. Her son, Rodger grew up in Fort Lauderdale, Florida with his father, stepmother, and stepsiblings. His family has reported that he never fit in and was a rebellious rule breaker. Rodger left home in 1968 to join the Navy and while serving in Hawaii married in 1970. In 1979, like his mother, Rodger abandoned his wife and two young sons and was not seen by the family again. Rodger Jr.’s oldest son fathered a child in 1999 and agreed to an open adoption. He refused any contact after birth. Did the fact that Geraldine Healy apparently spent most or all of the Great Depression in foster homes have multigenerational consequences? Geraldine died in 2011 Boca Raton, Florida. Her only child, Rodger, died in 2012 in Ft. Lauderdale, Florida. They were only 20 miles apart, yet they never knew each other. Ancestry.com, 1930 United States Federal Census (Provo, Utah: Ancestry.com Operations Inc, 2002), Population Schedule, Brockton, Plymouth County, Massachusetts, Enumeration District 40, Pages 8A-8B, lines 45-51, Image 516.0; FHL microfilm 2340674. Accessed 13 June 2018. Ancestry.com, 1930 United States Federal Census (Provo, Utah: Ancestry.com Operations Inc, 2002), Population Schedule, Brockton, Plymouth County, Massachusetts; Enumeration District 19, Page 9A, line 14; FHL microfilm 2340673. Accessed 13 June 2018. Ancestry.com, 1920 United States Federal Census (Provo, Utah: Ancestry.com Operations, Inc., 2010), Population Schedule, Brockton Ward 4, Plymouth County, Massachusetts, Enumeration District 68, Page 5A, lines 4-7. Accessed 13 June 2018. Ancestry.com, Massachusetts, Death Index, 1901-1980 (Provo, Utah: Ancestry.com Operations, Inc., 2013), William E Goodrich, 1924, Brockton. Accessed 13 June 2018. Plymouth County, Massachusetts, Lawrence Edward Healy and Ethel Goodrich, 26 September 1927, Certificate of Marriage, Register No 546 (Office of the Secretary, Division of Vital Statistics, Brockton, Massachusetts. Ancestry.com, 1940 United States Federal Census (Provo, Utah: Ancestry.com Operations, Inc., 2012), Population Schedule, Brockton, Plymouth County, Massachusetts, Enumeration District 12-17, Page 2B, lines 72-73. Accessed 13 June 2018. Ancestry.com, Massachusetts City Directories (Provo, Utah: Ancestry.com Operations Inc, 2005), Brockton, 1936, 1937, 1939, 1941, 1942, 1944, 1947, 1949, 1951, 1958, 1961. Accessed 13 June 2018. Ancestry.com, Massachusetts City Directories (Provo, Utah: Ancestry.com Operations Inc, 2005), Brockton, 1947, page 301. Accessed 13 June 2018. Ancestry.com, U.S., School Yearbooks, 1880-2012 (Provo, Utah: Ancestry.com Operations, Inc., 2010), Brocktonia, 1946, page 85. Accessed 13 June 2018. Ancestry.com, U.S., World War II Draft Registration Cards, 1942 (Lehi, Utah: Ancestry.com Operations, Inc., 2010), Lawrence Sherwood Healy, Serial Number U2183. Accessed 13 June 2018. Google Maps, https://www.google.com/maps, search for address “90 Gladstone St, Brockton, MA”. Accessed 13 June 2018. Stephen P. Morse, One-Step Webpages, Unified 1940 Census ED Finder, https://stevemorse.org/census/unified.html?year=1940 (Stephen P. Morse and Joel D. Weintraub, 2011). Accessed 2016. Jessica Holden, “Children’s Social Welfare Records at the University of Massachusetts Boston,” The TIARA Newsletter, Fall 2017, Volume 34, Number 3, pages 46-48, http://www.tiara.ie/TIARANewsletters/TIARANewsletterSept2017.pdf (Waltham, Massachusetts: The Irish Ancestral Research Associatation, Inc., 2017). Accessed 13 June 2018. Ancestry.com, Florida Marriage Indexes, 1822-1875 and 1927-2001 (Provo, Utah: Ancestry.com Operations Inc, 2006), James Edward Harding and Geraldine May Healy, 24 June 1983, Miami-Dade County. Palm Beach County, Florida, Death Certificate No. 2011062938, 11 May 2011, Geraldine Harding (State of Florida, Bureau of Vital Statistics, Jacksonville, Florida). Broward County, Florida, Death Certificate 2012256144, 14 September 2012, Rodger C. Clapp (State of Florida, Bureau of Vital Statistics, Jacksonville, Florida).